Peptide (C)RLRYNDTFETLILH, corresponding to amino acid residues 131-144 of rat GABRE (Accession Q9ES14). Extracellular, N-terminus. Homology Mouse - identical; human - 10/14 amino acid residues identical. Standard quality control of each lot Western blot analysis (unlabeled antibody, #AGA-015), and immunocytochemistry (labeled antibody). Cell surface detection of GABA(A) ε Receptor in intact living rat U-87 MG cells. A and B. Extracellular staining of cells using Anti-GABA(A) ε Receptor (GABRE) (extracellular)-ATTO-633 Antibody (#AGA-015-FR), (1:25), (purple) merged with live view of the cells. Olsen, R.W. and Tobbin, A.J. (1990) FASEBS J. 4, 1469. The GABA transmitter interacts with two major types of receptors: ionotropic GABAA receptors (GABAAR) and metabotropic receptors (GABABR). GABAARs belong to the ligand-gated ion channel superfamily2. GABA inhibits the activity of signal-receiving neurons by interacting with the GABAA receptor on these cells3. Binding of GABA to the GABAA receptor results in conformational changes that open a Cl- channel, producing an increase in membrane conductance that results in inhibition of neural activity2. GABAARs are heteropentamers, in which all five subunits contribute to the pore formation. To date, eight subunit isoforms have been cloned: α, β, γ, δ, ε, π, θ, and ρ1. Six α subunit isoforms have been found to exist in mammals (α1-α6). In most cases, native GABAA receptors consist of 2α, 2β, and 1γ subunits. The α subunit is the most common and is expressed ubiquitously. It determines the affinity of GABAARs for allosteric ligands. Each subtype has a unique regional expression in the brain, and individual neurons often express multiple subtypes4. 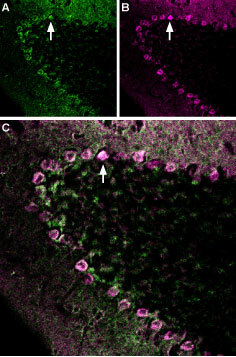 For example, the α4 subunit is detected in the hippocampus, cortex, olfactory bulb and in the basal forebrain5. Anti-GABA(A) ε Receptor (GABRE) (extracellular) Antibody (#AGA-015) is a highly specific antibody directed against an extracellular epitope of the rat GABA(A) receptor ε subunit. The antibody can be used in western blot, immunohistochemistry, immunocytochemistry and live cell imaging applications. It has been designed to recognize GABA(A) ε receptor from human, rat and mouse samples. Anti-GABA(A) ε Receptor (GABRE) (extracellular)-ATTO-633 Antibody (#AGA-015-FR) is directly labeled with an ATTO-633 fluorescent dye. ATTO dyes are characterized by strong absorption (high extinction coefficient), high fluorescence quantum yield, and high photo-stability. ATTO 633 has a maximum absorption at 629 nm and a maximum fluorescence at 657 nm. The fluorescence is excited most efficiently in the range 610 to 645 nm. This label is analogous to the well-known dyes Alexa 647, Alexa 633 and Cy5. Anti-GABA(A) ε Receptor (GABRE) (extracellular)-ATTO-633 Antibody has been tested in live cell imaging and immunohistochemistry applications. It is specially suited for experiments requiring simultaneous labeling of different markers. Anti-GABA(A) ε Receptor (GABRE) (extracellular) Antibody (#AGA-015), (for western blot analysis).